Your Eyes Are My Wake-Up Call | Good Morning, Beautiful! Some people are so good-looking that just seeing them in the morning makes for a better day. 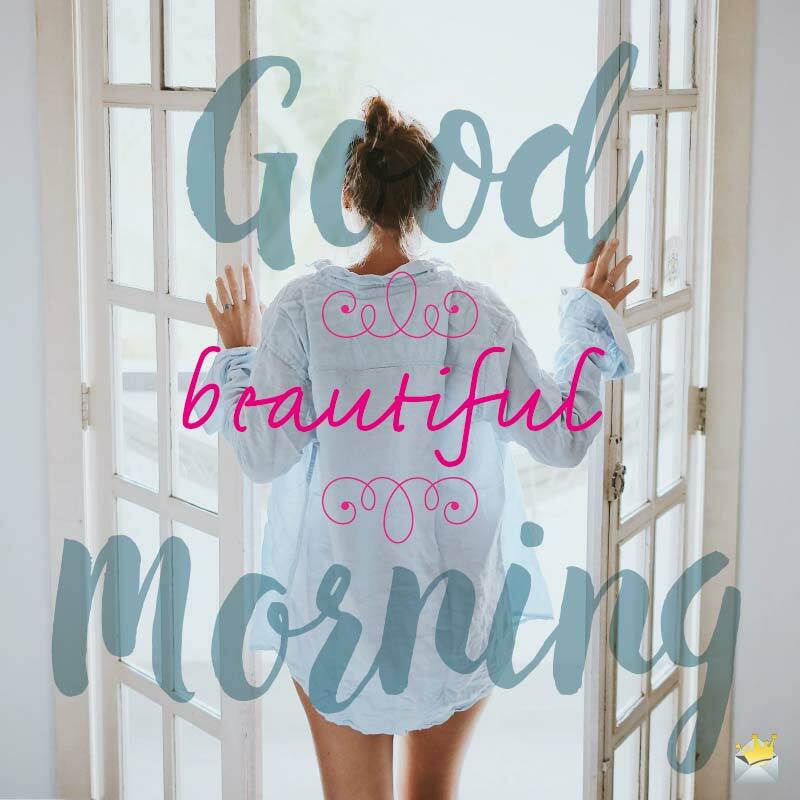 Here are some sweet morning greetings you can give to that beautiful woman or handsome man you know to wish them a good morning and also remind them that they have a true admirer in you! I stayed up the entire night, just in anticipation of this lovely morning when I get the opportunity to greet your beautiful face. I wish I could follow you on your commute to make sure no guys gawk at you, but that would probably prevent you from having a good morning, which is more important than my jealousy. Seeing your morning face the first thing when I wake up always takes me a few second to realize I am actually awake and not stuck in a sweet dream! You give my morning all the aesthetics it needs to encourage me to go out and have a fine day! Is it odd that in the morning that I desire to see your face more than even the daybreak sun? Nothing makes me feel more blessed in the morning than greeting a face like yours, completely unblemished by the evils that lurk in the night! You are like a morning star that glitters majestically, even in the sunlight. Any morning spent looking at you is a good one! I love you, dear. Watching you sleep in the early morning is like beholding Sleeping Beauty in her slumber. Your beauty is softer on the eyes than even the daybreak clouds. Good morning, beautiful! I wish I could be the bath towel that gets the priceless privilege of enveloping your frame every morning! Your morning beauty is bedecked with all of the qualities that make me appreciative to be alive! Your awakening in the morning is as magnificent as the blooming of the most beautiful flower in response to the daybreak sun. I can wake up to a hurricane raging outside, but once I get a look at you, it’s like there isn’t a single cloud in the beautiful morning sky. You are the kind of woman who can bring about world peace, if every man were able to wake up and bear witness to a loveliness like yours! Your morning beauty has my full, undivided attention! Beholding your beauty in the morning is an uplifting experience! I had to make my first priority of the day coming to see you just so I can be a beneficiary of your lovely morning aura. You are more shapely than a horizon of mountain accentuated by the daybreak sun! I know today is going to be a beautiful day! Your morning appearance shines as if you sleep on the banks of the fountain of youth. You have already been blessed with beauty, and now I am hoping that this morning blesses you with many other gifts as well! I would love to just dip you in a cup of coffee and take a big bite out of you for breakfast. Such is how sweet you are to me. You are beautifully decorated in the morning, like a donut glazed with the most delectable toppings on earth! I can never report to office with you on my mind because my thoughts of you are NSFW. Just as birds can’t wait ‘til daybreak to acknowledge the sun, my morning is highlighted by acknowledging the beauty that is you! My entire inspiration for getting out to work this morning is knowing that I can use the fruits of my labor to further my cause of pleasing you. I don’t know what’s more stunning at first light – the daybreak or your lovely morning face! 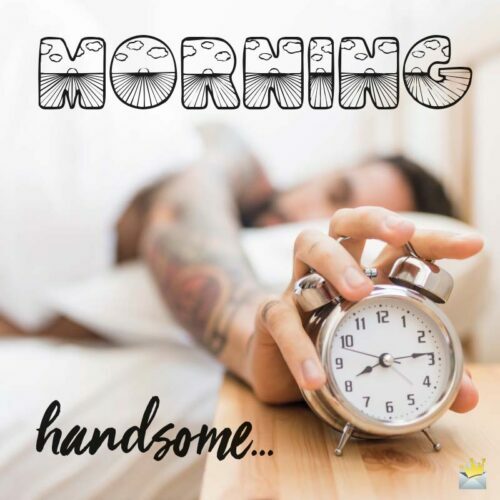 Your handsome morning face is like the eighth wonder of the world. Seeing your handsome face in the morning makes me get on my knees and praise God for His creations of unparalleled beauty. Sometimes I wonder what great feat I accomplished in life to earn the opportunity of waking up in the morning next to a man as lovely as yourself. Your handsomeness is more wonderful than the morning sunrise. Good morning, dear. The favor of the universe is upon you, which becomes evident every time I bear witness to your morning glory! Having a man as lovely as you to grace the morning with is a luxury many women don’t have. The morning has blessed you with a beauty few people possess, and I hope you are appreciative of this privilege! Be still my love – I just want to bless my morning by sitting back and getting a good look at your lovely frame! Your godlike appearance leads me to believe that an angel himself has come to visit me this beautiful morning! The sturdiness of your frame ripples through my morning like the daybreak sun glides across the ocean’s waves. Watching you get dressed in the morning is an extravaganza worthy of a round of applause! Your handsomeness puts the wow factor in an otherwise average morning. Waking up with you is like enjoying a breakfast served with a big hunk of love on the side. Beholding your forenoon beauty is all the nutrients my mind needs to have a lovely morning! Good morning, good-looking. I hope and pray that you have a beautiful day! How wonderful it is to be able to bring in a new day with someone as lovely as yourself! I would love to apply for a job to be your morning maid! Good morning to the one I love, and thank you for once again giving me something beautiful to look forward to! Your morning radiance blinds my eyes even more than the daybreak sun. You’re truly remarkable, and I thank God so much for your life. Your morning appearance is so dignified, as if angels spent the night polishing your body as you slept! Good morning. You are a terrific example of a man, one in whom I can’t let the opportunity pass to extend my warmest greetings that you have a glorious morning. Your body is perfectly and scrumptiously portioned like a nutritious, well balanced breakfast!